Our good friend and customer Leo Herrera, guitarist of the Santana tribute band Caravanserai, asked us several years ago to make a custom-order “Supernatural” model strap. The strap was similar to our Durango-Suave snakeskin strap, but in a wider 3 1/2″, rear-buckle adjustment, backed with two layers of our glove-soft “Suave” cowhide. We were pleased to accommodate his request. 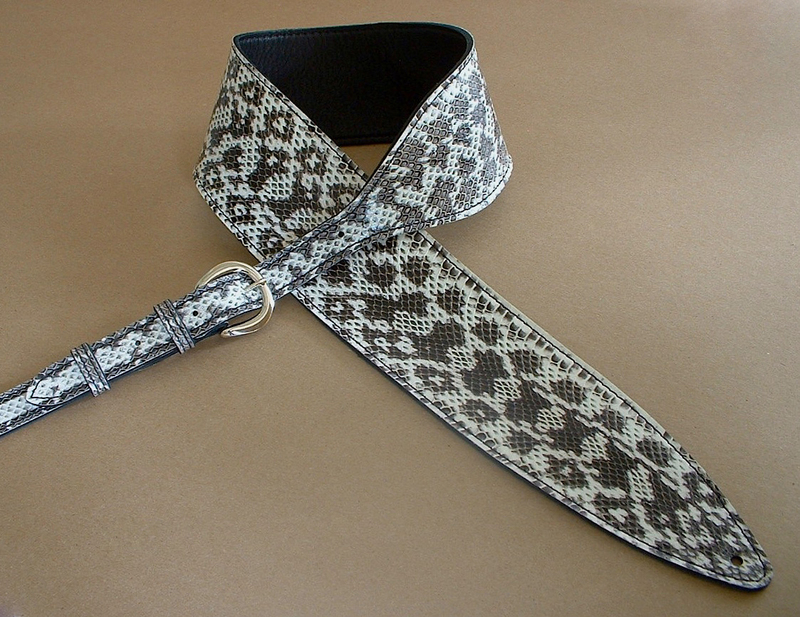 Several weeks ago Leo contacted us for a second Supernatural-snakeskin strap. We were happy to oblige. With Leo’s permission, we are sharing a photo of the completed strap. Check out the Caravanserai videos, and if you’re ever up in Northern California check out Leo and Caravanserai live! This entry was posted in General, Product News, Sticky on March 20, 2018 by Bill Silverman. Tele™, Telecaster™, Strat™ and Stratocaster™ are registered trademarks of Fender Musical Instruments.